Tenley 3-pc. Dining Set With its unique blend of soft black with grayish brown, the Tenley round drop-leaf table serves up cottage-chic style with sophistication. When accompanied by the matching pierced ladderback chairs, what classically charming scene that’s sure to satisfy for years to come. With its unique blend of soft black with grayish brown, the Tenley round drop-leaf table serves up cottage-chic style with sophistication. When accompanied by the matching pierced ladderback chairs, what classically charming scene that’s sure to satisfy for years to come. L: 40" x W: 34" x H: 30"
L: 40" x W: 27" x H: 30"
L: 20.5" x W: 18" x H: 38"
Choices were abundant. Styles and sizes were varied. Found the perfect dining set for our need. Salesman was fast, knowledgeable and so pleasant. Perfect set for this space. Was so grateful for the 2-chair option...that was all we needed! The kitchen set is very nice and the sales person Ana was excellent. Good quality reasonable price. Delivered as promised and they do the set up. The table has very easily manipulated sides. It’s the perfect size and color for my space and well priced. I am very pleased! Beautiful set to accommodate a small kitchen area. This set offers affordability without lacking quality or style. Love it! 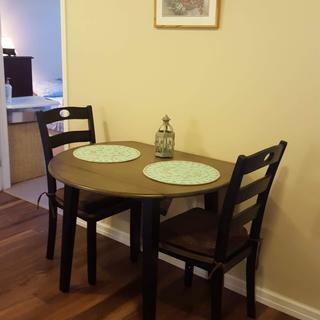 the Tenley 3 piece dining set fir our kitchen perfectly. The grayish brown color went well with our brown walls. The chairs are sturdy and comfortable.